Author Vincent Carretta’s research on this talented young woman is thorough, and he presents the historical information in an intriguing manner. Credited as being “. . . the first English speaking person of African Descent to publish a book and only the second woman—of any race or background—to do so in America,” Wheatley is a subject deserving of a biographical study. Mr. Carretta’s opening chapters provide great detail about the history of the New England area, especially Boston, with a focus on slavery as it relates to the differences between northern and southern slavery. Much of the historical picture painted by the author revolves around people other than Wheatley. The author spends considerable time discussing persons who were her contemporaries of African descent and whites that influenced and supported her in a variety of ways. This leads the reader to understand that there is probably limited historical data available on this subject’s early years. Mr. Carretta remarks upon how Wheatley’s upbringing in a white family accounted for much of her success. It is clear that Wheatley’s owners, John and Susanna Wheatley, provided opportunities far beyond the reach of other slaves, and Mr. Carretta posits that Phillis may have served as a surrogate daughter for a child lost at an early age. Phillis’s education in academics and religion, and her exposure to important people in her personal life, played a major role in her writings and acceptance in society. Vincent Carretta displays a strong knowledge of poetic style, explaining in detail the various styles Wheatley used in her writing and he shows through his explanations how her writing changed and grew over a very short time. He places attention on the careful choice of words that Wheatley used to paint pictures of the people or situations she wrote about, with attention to her religious beliefs blended into her writing as well. Mr. Carretta cites many poems, some known to be hers, some simply credited to her, some unpublished or lost but with historical references. These works paint a picture of a prolific writer; gifted with an active imagination; focused on a wide spectrum of activities that others in her position would have been blind to, including government/political activities and religious actions of devout individuals. Her poems and elegies often were written as dedications to persons recently deceased, and these works were presented to surviving spouses or parents. 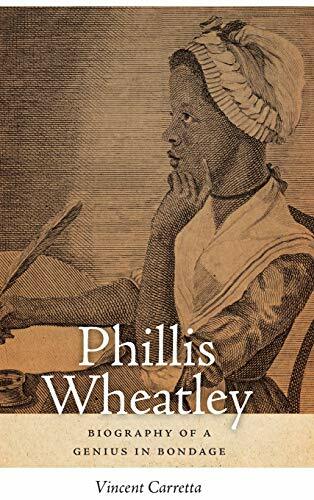 Phillis Wheatley seemed to have an innate understanding of the importance of self-promotion and solicited assistance in publishing her own works. Support came in many forms including attestations to the verity of her work by many politically and socially powerful men. These attestations helped her as her name and writing credits spread across the ocean to Britain. Book publishers would seldom chance publishing a work by an unknown entity, and especially a black female, but supported by these eminent men in America, she found doors opened more easily. As Phillis Wheatley’s fame grew, her successes brought her extraordinary opportunities, not the least of which was traveling to Britain to promote her work. Her experience in London was truly unique, in that she traveled in social circles different from those in Boston. Her hosts, many politically and socially prominent people, often treated her as a celebrity, not a servant, and lavished gifts upon her. Faced with the opportunity for freedom in England, or returning to Boston, she accepted an offer made to her by Nathaniel Wheatley, the son of her owner, that if she returned to Boston, she would be given her freedom. She received her freedom, but quickly came to realize that freedom brought with it responsibility. Thus life changed for Phillis. Revolutionary causes arrived on American shores and Wheatley became more involved in issues of equality. She met and married John Peters in 1778, and Carretta details their short life together and their travels with some discussion about Peters’s challenging life after emancipation. In all, this is a graceful story about a talented woman whose poetry and prose have, for the most part, survived for over 200 years. Mr. Carretta certainly does justice to Phillis Wheatley’s story.